Our April General Neighborhood meeting is going to be HUGE! 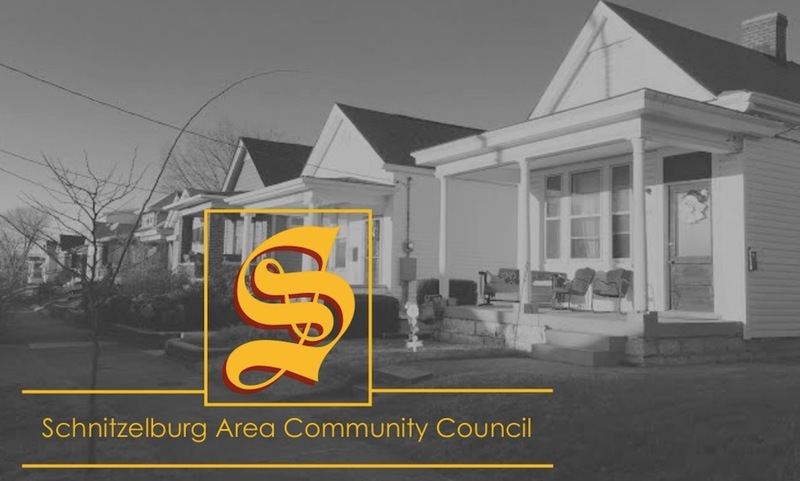 SACC General Meetings are a time to mingle with neighbors, hear the latest happenings in Schnitzelburg, and listen to some amazing speakers! Small Electronics: Such as old cell phones and tablets. According to Earth911.com, plastic casings can take hundreds, if not 1,000 years, to start breaking down in landfills. Lead, arsenic, zinc, and other compounds inside the phone can leach into and pollute surrounding soil and water. Burnt-out CFL Bulbs: Unlike regular light bulbs, CFL bulbs require special disposal because some may contain mercury - a hazardous material. It is very important that you never break a CFL bulb, but if you do, take special precautions while cleaning it up. We will be taking all the CFL's we collect to Lowe's where they have a CFL recycling drop-off. Prescription Drugs: Not only are unused/unneeded medications susceptible to falling in the wrong hands, but throwing them away is hazardous to the environment. Medications can be absorbed into the soil and deposited into our waterways, thus contaminating our water supply. Please keep the medications in the original containers so that the a Walgreens pharmacist can identify the medications- just scratch off any personal information on bottles. Please do not bring any needles or personal waste products. Plastic Shopping Bags: Plastic shopping bags can be recycled into products such as new plastic bags, landscape materials, and plastic composite lumber. All Kroger stores have plastic bag recycling centers located near the entrance to the store and this is where any collected bags will go! Eyeglasses: Your old eyeglasses can be used for good instead of collecting dust. We will be donating all eyeglasses to the Kentucky Lions Eye Foundation, where eyeglasses are cleaned, sorted by prescription, and given to low-income, visually impaired individuals. Medical Surplus Items: Walkers, wheelchairs, orthopedic items, diabetic supplies, bandages and gauze pads, canes, etc. will be collected and taken to Supplies Over Seas, a local nonprofit organization that meets critical healthcare needs in medically impoverished nations across the world by collecting and distributing surplus medical supplies. Personal Documents: We will have a few shredders on site for your important documents that should be destroyed, such as bank statements or any confidential information. Please be mindful of the amount of documents you bring. Our main speaker will be Lorri Roberts with Brightside. She will be recapping our latest Brightside community clean-up and discussing all the projects Brightside has going on currently! Other speakers include Michele Johnston (Fresh Stop), Jordan King (A Taste of Germantown & Schnitzelburg), and Christopher Kitchen (Louisville Metro Police). Officer Kitchen is our new Fourth District Resource Officer. He will be updating us on crime in the neighborhood, as well as explaining how you can sign up for crime alerts. The meeting is also a great time to approach Officer Kitchen about any questions or concerns you have. Be sure to say hello! As usual, we will have food and refreshments available, and the All Wool & a Yard Wide Democratic Club will be selling ice cold beers! 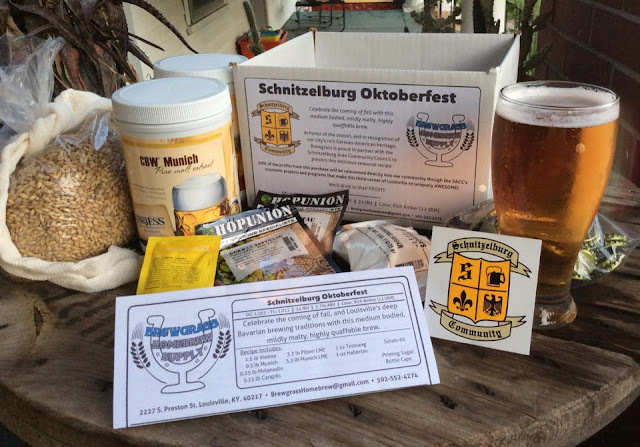 Tickets for A Taste of Germantown & Schnitzelburg will be available for purchase at this meeting for a discounted rate of $25 for Germantown and Schnitzelburg residents (regular ticket price is $50). Tickets will be for sale before and after the meeting. We ask that you bring a check made out to "LLS - A Taste of Germantown & Schnitzelburg." Below is a Q&A to help you better understand this fun event! Wednesday, May 20th from 6 pm to 9 pm. Outside of the Germantown Mill Lofts (FKA the Goss Antique Mall). McHenry Street will be closed the day of the event and a large tent will be constructed in the middle of McHenry. A completed section of the Germantown Mill Lofts will be open for walk-throughs during the event. Tony and the Tanlines at LIBA's 10th Birthday Party. A Taste of Germantown & Schnitzelburg will be just that - a taste of all the best local fare our little neighborhoods have to offer! Guests will sample small plates from a variety of area restaurants and wash it down with cocktails and craft beer. 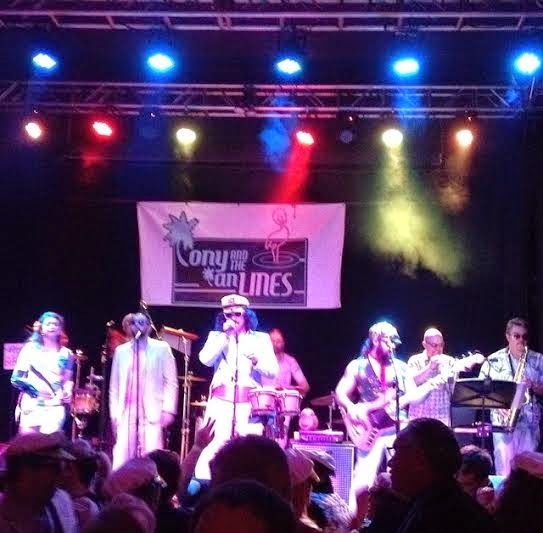 Tony and the Tanlines, an energetic cover band, will be performing. Underhill Associates, the developers for the Germantown Mill Lofts, have been working with neighborhood associations to put the event together. The event is a fundraiser for the Leukemia Lymphoma Society Kentucky and Indiana Chapter. The Leukemia & Lymphoma Society is the world's largest voluntary health agency dedicated to blood cancer. LLS funds lifesaving blood cancer research around the world and provides free information and support services. All proceeds will be donated in honor of the late District 10 Councilman and Metro Council President Jim King, who passed away in January after a battle with cancer. What restaurants will be participating? Check's, The Post, Hammerheads, Lydia House, Eiderdown, Comeback Inn, Danny Mac's Pizza, Dairy Del, Four Pegs, and Smoketown USA. Tickets for Germantown and Schnitzelburg residents are for sale ONE NIGHT ONLY at the April 27th General Neighborhood Meeting at a discounted price of $25. Otherwise, invitations were sent out by the Leukemia Lymphoma Society to a special guest list. The event will only consist of 300 guests, as that is the number that works best for restaurants to plan for food. You bet! 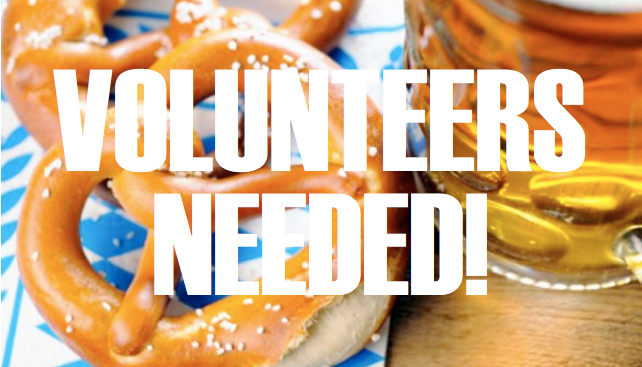 Volunteer positions from parking lot attendants to food servers are needed for the event. Volunteers will have a job to perform, but they will be able to get into the event for free and eat and drink during the event. If you are interested in volunteering, please email Jordan Mitchell at jordan@m3-llc.com. Volunteer spots are limited and filling up fast, so sign-up today! If you have anymore questions about A Taste of Germantown & Schnitzelburg, please contact Jordan King at jordan@uhill.org. 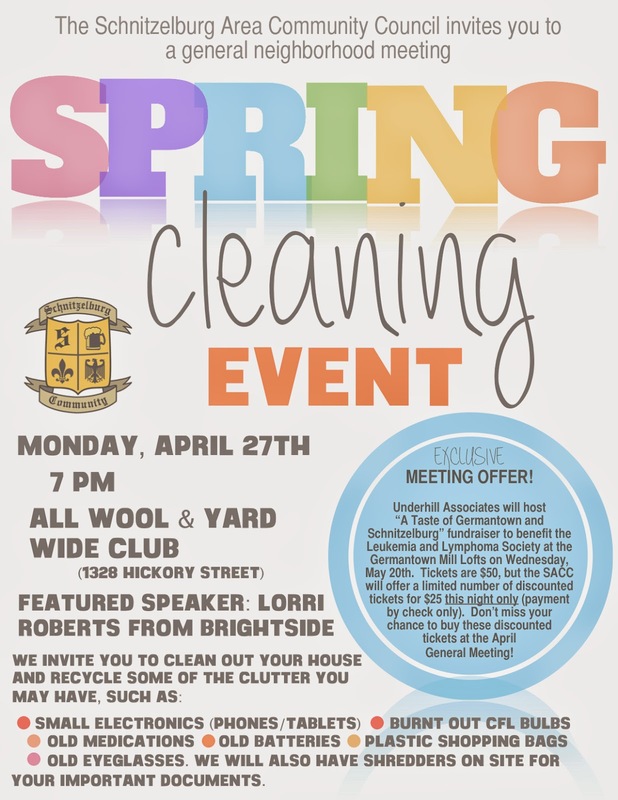 We can't wait to see everyone at the April General Meeting Spring Cleaning Event on April 27th at 7 pm at the All Wool & Yard Wide Club (1328 Hickory Street)!